This pose helps calms the brain and reduces stress, headache, fatigue, and insomnia. It relaxes the body and helps lower blood pressure. 1) From a sitting position turn to one side and gently lower into a side-lying position, then roll onto your back. 2) Take care to position the legs evenly angled away from the midline of the body and the arms out the side, palms face up. Make sure the shoulder blades are relaxed and spread the collar bones. 3) Allow the inner muscles of the legs, arms, and face to soften. Release any lingering tension in the body as you scan head to toe. Let the eyes be heavy and close the lids dropping inwards into the pose and releasing the external world. 4) Remain in this pose for 10 to 30 minutes while you integrate your mind, body, and spirit and allow your whole being to refresh and renew once more. 5) To release from the pose being by wiggling the fingers and toes, waking the body and then stretch the arms overhead and lengthen the spine with a few deep breaths. Bend your left leg and roll onto your right side. Stay here for a few breaths before pushing up to a comfortable sitting position. 1)Use a block and sandbag to deepen the pose by adding weight to the top of the head. 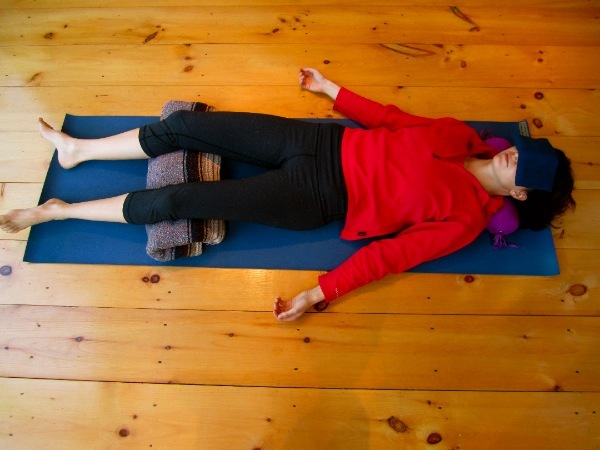 In Savasana, start by placing the block above the head at a 5 inch height. Next, lay the sandbag over the block and your forehead. Observe as your skull experiences a distractive force and allows the brain to sink away from the weight. 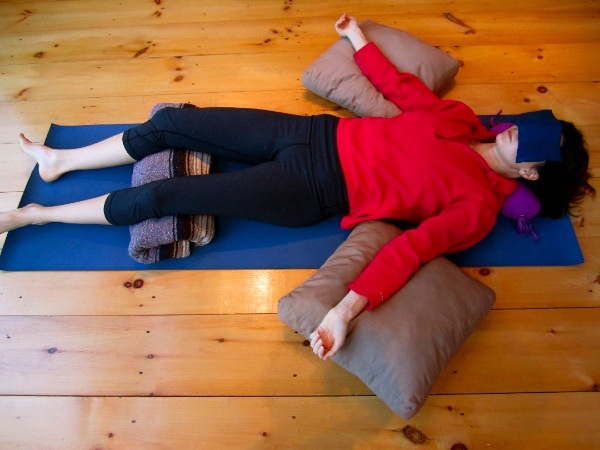 2) Position a bolster under the knees and pillows under the arms to support their weight. 3) Add a towel roll under the cervical spine to increase support and improve alignment to the neck. While holding the pose maintain a smooth, slow and gentle breath pattern that is soft, calm and easy.